Haymaking is widespread in Alba County both in the hill & mountain villages and throughout the flat low lands. Orchards are also widespread though tended to be concentrated around villages. In the south and centre of Alba County, plums dominated the orchards. The plums are made into Rakia, the local spirit drunk anytime from breakfast to bedtime. This spirit is home produced and is a cultural indicator of the characters involved. When aged for 20 yrs in a mulberry cask or blended with homemade walnut cordial, it is a very smooth and enjoyable drink. 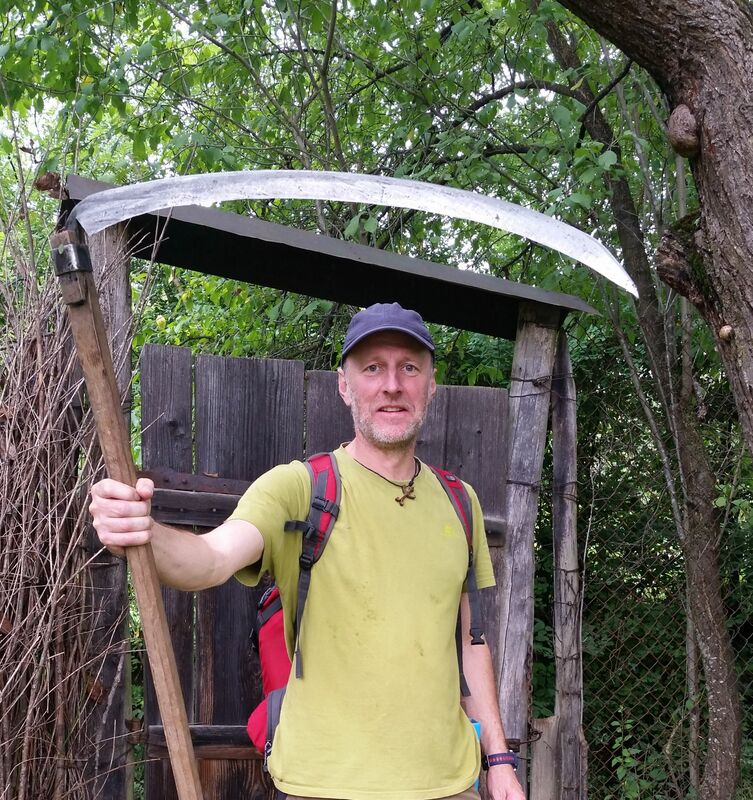 W e engaged in mowing by scythe in Girbovita village near Aiud. The location was a hay meadow above the village which we arrived at after walking through an orchard. The sward was herb dominated rather than grass dominated. We joined the farmer with some extra scythes and were given a brief demonstration before having a go ourselves. It took some practice but it was possible to quickly cut a swath of grass. O n another occasion, we went to rake a small very steep meadow surrounded by woodland. It was planted with young walnut trees as a new orchard. This location really emphasised the versatility of the scythe. The steepness and the young walnuts would have made it impossible to use even pedestrian machinery. However, with hand tools it was fairly quick work. T he Romanian experience has led to a great deal of reflection on how hay, orchards, amenity grassland, ‘rough grass’ and agricultural set aside is managed in Britain. The tendency to use rotary mowers and in the agricultural setting mower conditioners, must have an impact on invertebrate life. In Romania, we were able to experience what is possible with grassland management when it is more sympathetic to biodiversity. It has been enlightening.